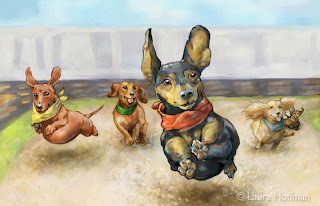 I just found out - to my delight - that California State University Fullerton (CSUF) has decided to acquire my painting "Dachshund Race" for the university's permanent art collection. 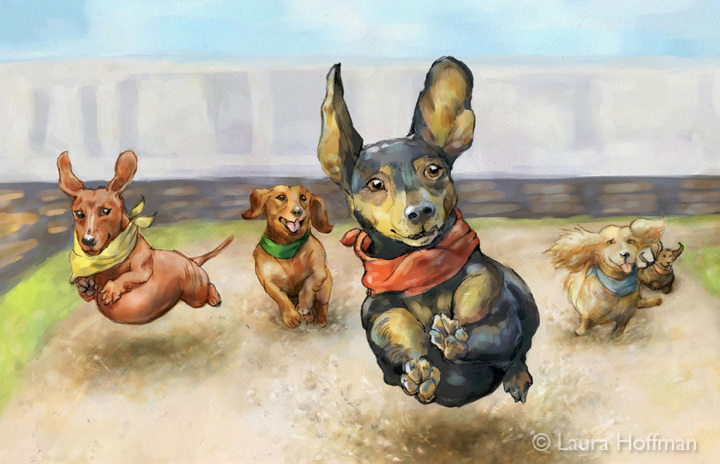 Dachshund Race was inspired by an assignment to create a painting that is full of action. So I decided to challenge myself by painting a point of view one seldom sees. Dachshunds (also known as wiener dogs) are hilarious dogs - so low to the ground. So why not show a point of view that is even lower than a doxie's? For the main character, I picked the dog I grew up with - my first exposure to the lure of the dachshund. Since then my sister Karen and I have fallen in love with the breed. The dog on the left is my current muse, Penny. Next dog is Ari, who was my 2nd doxie and the focal point is Jupi, my first dachshund ever. I loved that guy. He was also my first loss; when I was 13, he was hit by a car and we grieved as if we lost a sibling. The Dackels (German word for dachshunds) on the right are future dachshunds that will most likely come into my life - that is why they're painted with less detail - I just don't know them yet. They all have the same goal, to hit the finish line and land in the arms of the one person they are loyal to. That is the thing with dachshunds; they pick one person to love and that one person becomes their absolute focus. This painting has made the rounds; has been exhibited at two juried exhibits this year: The Brea MFA show and the OC Fair. Now it has found a permanent home after making its debut at CSUF in a three woman MFA art exhibit in December 2011 alongside Barbara Malley and Wendy Grieb, my colleagues at CSUF. So now the painting has gone full circle. I am especially excited because CSUF is my alma mater - I earned my Bachelors of Art in Art there (go, Titans!) and now I'm back - earning my MFA - with a concentration in illustration, graduating in 2014. Currently, I have the honor of teaching 2D design at the university. To know this painting will hang there long after I'm gone makes me very happy. This piece would bring a smile to anyone's face. Great job! I love this! My mother loved dachshunds and we had a short hair brown dachshund and a long hair black and tan. It's so cute. This painting made me smile! Oh my! This painting made me LAUGH. What great action and flying ears! I of course have never seen a dachshund anywhere near airborne, but what a lovely vision. This is truly innovative and making me smile!! !